This is another village situated above red Triassic Otter sandstone, with a most striking church (shown left, from the west) constructed almost wholly of this material, except for the dressings in golden Jurassic Ham Hill stone. Consisting of a chancel, a nave with a S. porch, a large independently-gabled N. aisle that continues for one bay as a chapel alongside the chancel, and a W. tower, it retains as its earliest features, the Norman-Transitional S. doorway (inside the porch) with a round-headed arch above a curved lintel, and the very crudely constructed tower arch, which is pointed but bears only the slightest of flat chamfers. The upper parts of the tower appear to date from the second half of the fourteenth century to judge by the two-light bell-openings with straightened reticulation units in the heads; the W. window has alternate tracery and the whole structure is supported by a diagonal buttress at the northwest corner only, beside which a projecting semicircular stair turret rises about halfway up. The rest of the building seems likely to date from the fifteenth century, apart from the Tudor N. wall of the N. aisle. Walking clockwise around it, the N. aisle W. window and N. chapel E. window are four-light, with supermullioned tracery, subarcuation of the outer lights in pairs, and through reticulation. The three-light N. windows between are square-headed, untraceried and uncusped, and there is a very depressed N. doorway with tiny spandrels containing shields. Between the second and third windows from the west, there is a very large, flat, semi-octagonal projection for a stair turret, the importance of which becomes evident inside. The three-light chancel E. window has alternate tracery with subreticulation, and the chancel S. windows are two-light, square-headed and untraceried. The nave S. windows are similar and there is another, squashed in, high up to the east, whose function is obviously to cast light on the rood loft. The porch has three-light, square-headed side windows with nice supermullioned tracery, and a segmental-arched outer doorway. However, the church interior is more interesting than the exterior, due chiefly to the huge fan-vaulted rood/parclose screen that extends right across the nave and N. aisle, in five and four bays respectively. It is particularly impressive for the four tiers of carving on the top rail and cornice (illustrated right), and features brattishing above, carved leaf bosses on all the nodes, blank cusped, fish-shaped arches in the spandrels, and piers with three narrow shafts attached to the east and west, with little capitals from which the vaulting springs. 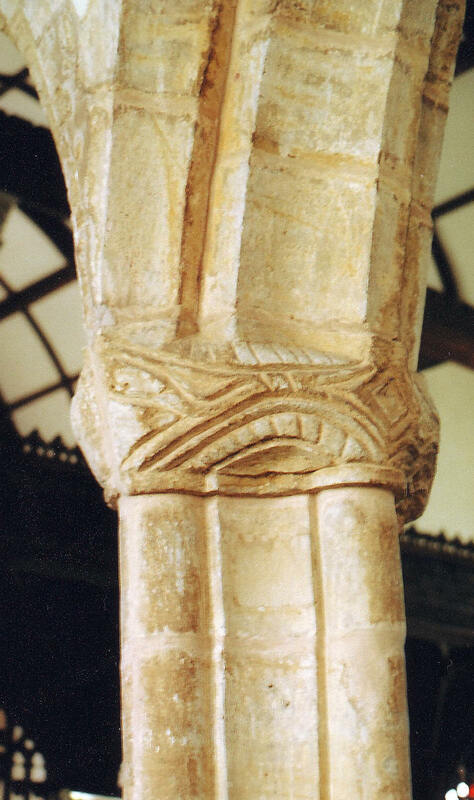 The N. arcade in Ham Hill stone - which could derive from around the same time as the bell-stage of the tower - is composed of arches bearing two wide hollow chamfers, springing from piers formed of four semicircular shafts separated by hollows, standing on tall irregular octagonal bases and terminating in capitals displaying carved lions (shown left). The arch between the chancel and N. chapel is another double arch like that in this position at neighbouring Combe Florey: parallel arches bear hollow chamfered mouldings and are supported on semicircular corbels to the west and on responds to the east that match the style of the nave arcade; these are constructed of Ham Hill stone while the recess between is of contrasting Otter sandstone. The roofs of the building are everywhere of wagon type, now ceiled and seemingly renewed in the nave, but still open and probably at least partly original in the chancel. The aisle roof continues over the chapel without structural division. Most other woodwork appears new, but the circular font, which is probably Norman-Transitional again, has blank fish-shaped arches around the bowl like those beneath the rood screen vault, and is in all probability the source of that design, although it is also one that fits these curved spaces particularly well.